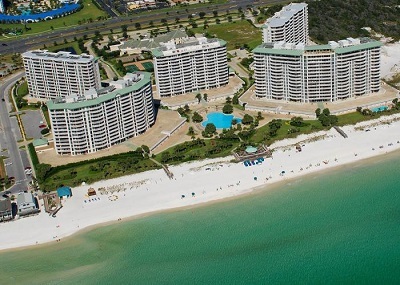 Destin Florida vacation rental at Silver Shells condos. This luxury vacation home features amazing views from its 9th level balcony & the bedrooms! St. Professionally decorated resort residence with West Indies inspired decor in warm reds and gold, and boasts 1,350+ s. f. of living space! The fully equipped kitchen features granite counter-tops, stainless steel appliances, and an array kitchenware for creating the best meals from the comfort of this vacation home. The St. Lucia building is the newest tower at Silver Shells Beach Resort & Spa; community amenities also include a children’s pool, community hot tub, free WiFi, exercise facility, on-site full service European style spa, 2 tennis courts, large basketball court, a children’s playground, and a Tiki Beach Bar! Also on-site is the World famous Ruth’s Chris Steakhouse. Close to numerous popular shopping and dining venues, award winning golf courses, and lots of activities for children and adults alike.